Everspin’s newest MRAM technology use the spin torque transfer property, which is the manipulation of the spin of electrons with a polarizing current, to establish the desired magnetic state of the free layer to program, or write, the bits in the memory array. 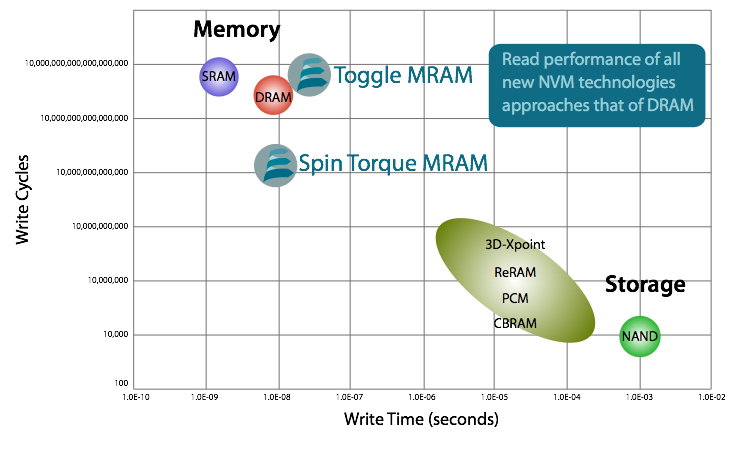 Spin-transfer Torque MRAM, or STT-MRAM, provides a significant reduction in switching energy compared to Toggle MRAM, and is highly scalable, enabling higher density memory products. Our third generation of MRAM technology uses a Perpendicular MTJ. We have developed materials and Perpendicular MTJ stack designs with high perpendicular magnetic anisotropy, which provides long data retention, small cell size, greater density, high endurance and low power. The first STT-MRAM products from Everspin utilize ST-DDR3 which is a JEDEC-like DDR3 interface with some modifications needed to take advantage of the persistence from MRAM technology. These products perform like a persistent DRAM but with no refresh required. Additional products are planned which will utilize high speed serial interfaces for a wide range of embedded applications.